The past couple of days have been filled with shopping, organising dinners, decorating the house, wrapping presents and writing cards. I already have pine needles on my carpet, enough fairy lights to give me a dizzy spell and a freezer filled with more smoked salmon I know what to do with. And in between all this, I’m also testing recipes like crazy. Just this morning I had a glorious failure, involving a cinnamon & clove orange cake, filled with crunchy nuts and glazed with too much butter and honey. It came out of the oven all messy, crumbled and disastrous-looking, yet was so delicious, I’ve already devoured half of it. See, desserts are my main obsession during the holidays- sure, I love presents, and fairy lights, I love wrapping paper and writing lists (I LOVE making lists), roast meat, sweet quince and crunchy oven roasted potatoes drenched in goose fat- but what I mostly love is sweets. I still haven’t decided on a show-stopping, breath-taking dessert for the holidays. I have my mind set on said cake, but choosing just one dessert seems quite impossible. 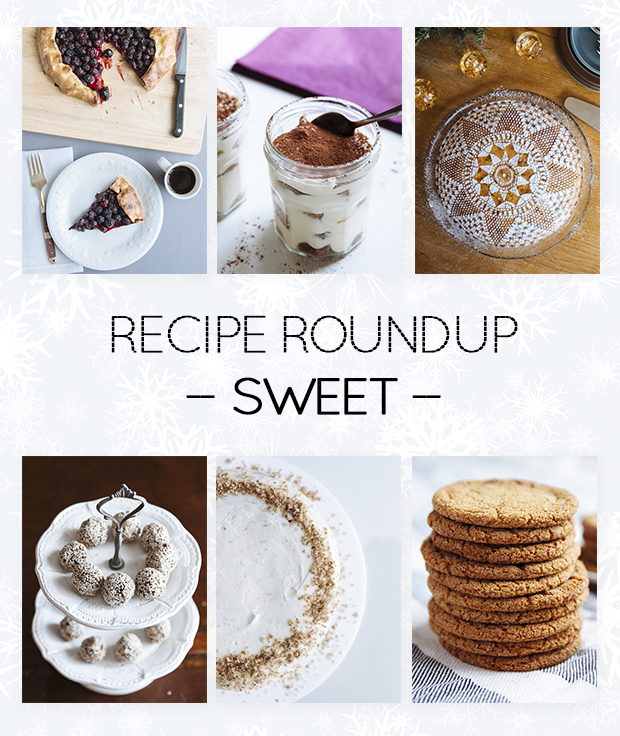 So, while I’m on the fence and almost in a sugar coma in my messy, flour, sugar and spices covered kitchen, I thought I’d share with you some of my favourite desserts featured here in the past. Have a look, give them a try, change them up, go with what you like, make them your own. I hope they inspire your holiday meal planning or at least give you lots of delicious spoonfuls during the hectic, chaotic and absolutely worth it pre-holiday craze. You just can’t stop, won’t stop making this blueberry, lime & lavender galette over and over again. Use frozen berries if you can’t get hold of fresh ones or apples and pears instead and get ready for buttery, fruity and fragrant heaven. Damn! The simplest, easiest, most delicious tiramisu, filled with strong espresso, booze and velvety cream. My favourite cake of all time is Vasilopita, traditionally made in Greece for New Year’s Eve. This version is filled with buttermilk for extra fluffiness and pistachios & grated tonka bean for extra flavour. Fruity, spicy and sesame covered bites– so delicious and good for you! Mango, turmeric, pecans and tons of lime cream cheese frosting for the best carrot cake ever! If you’re looking for an alternative to gingerbread cookies, look no further: these ras el hanout soft and chewy cookies are sweet, spicy and insanely aromatic.